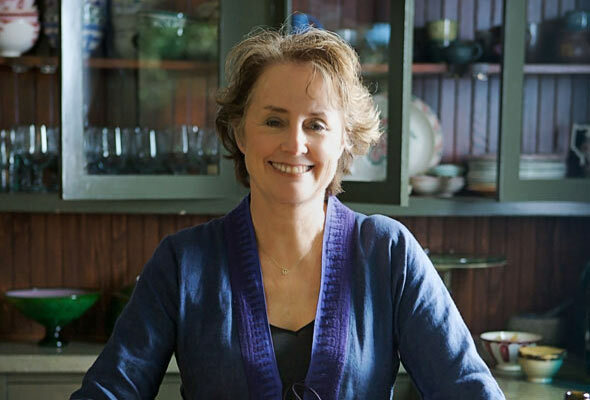 one sunday morning in high school, while getting ready to go to church, i flipped on the television to pbs and found a documentary on alice waters. immediately transfixed, i plopped down on the couch, halfway dressed, and watched through the end (nearly missing church altogether!). since then, i've been obsessed with the soft-spoken and whimsical berkeley chef who many call the mother of the organic, slow food movement. thanks to a dear friend, i had the opportunity to dine at the chez panisse cafe in berkeley last year. i still dream about the perfect sweet peas and linguine with clams I ate as the hazy afternoon light streamed into Waters' perfect restaurant. this saturday, while exploring hill's kitchen in eastern market with a friend, i flipped through In the Green Kitchen, and within two pages I was hooked. I rushed home and ordered that and one more book from Waters. they need to arrive ASAP! I cannot wait. she goes on to explain how to dry the lettuce (with a salad spinner or a clean kitchen towel), make the dressing (with a mortar and pestle), and dress the salad (with your hands, so as not to crush the leaves). OK, so is it rocket science? No. but it is inspiring, simple, and practical advice. what i love is that Waters does whatever she can to bring beauty and elegance to her "daily bread," if you will. she relishes in the simple pleasures of cooking and eating well. it's enough to make this busy 28-year-old want to run out to the farmers' market every saturday morning and spend all week washing, drying, and dressing seasonal greens. for your edification, here's a great 60-minutes interview with Waters.